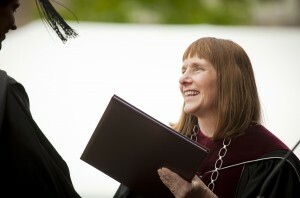 President Alison Byerly presented her farewell remarks to graduating seniors at the 181st Commencement. Her speech is below. It is a privilege to have the opportunity to close this ceremony by offering a few brief words of my own to the graduating class. The Class of 2016 is very special to me. I have come to know many of you through your roles in student government, on athletic teams, as performers, as outstanding students, as thoughtful leaders of important community discussions, and as participants in the many activities that enliven the campus. I have also had the opportunity to have 21 of you as students in a course, Fictional Worlds, that I taught this spring. It was wonderful to get to know you as students, in the classroom, and see first-hand your extraordinary intellectual energy and spirit of engagement. Much of this ceremony focuses, appropriately, on individual achievement. Every one of you should feel enormous pride in your success as graduates of Lafayette College. And of course, we are tremendously proud of those of you who have won awards, including two Fulbright winners, and many other national awards and honors. At the same time, I hope that you will all feel collective pride in what you have accomplished as a community. Your class played an important role in a historic college event, the 150th Lafayette-Lehigh game played last year at Yankee Stadium. Whether you were a player, a performer in the halftime show, or one of the cheering thousands in the stadium, you can claim to have been part of something that will be looked back on for many decades to come as an extraordinary concentration of Leopard pride. The class of 2016 has also faced some unusual challenges. You have the distinction of being a class whose time here was bookended by two significant campus disruptions – Hurricane Sandy in the fall of 2012, when you were first years, and this spring’s virus outbreak. I have heard many of you speak about your experience during Sandy as a highlight of your time here, as it was a bonding experience that brought you closer to your friends and classmates. It doesn’t escape my notice that both of these events involved canceled classes, which might have been part of what made them special. Similarly, during this spring’s illnesses, I was very impressed by the care and concern that friends showed for each other. Most importantly, you faced the tragic loss of a friend and classmate with a spirit of empathy, mutual support, and motivation to create something positive from that loss. All of these things have, I believe, made you stronger as a class. We spoke earlier in the ceremony of the importance of the College’s connection to the Marquis de Lafayette. A key dimension of the Lafayette ideal is the fact that the college is named after a man who shaped his own identity and chose his own destiny. The choice made by the citizens of Easton to embrace the Lafayette ideal explains much about the unique spirit of Lafayette College. It is a place that reflects, and fosters, a powerful sense of self-determination. It is a place that asks you to seek an ideal, and live up to it. We hope that as you go out into the world, and define your own path, you will see in the spirit of Lafayette an example to follow. We hope, too, that wherever your voyage takes you, you will continue to be sustained by the strength of the Lafayette community: by the faculty who mentored you, the staff who supported you, and the friends that you have made. Though today you will depart from Lafayette’s campus, you will never leave Lafayette behind. I hope that you will stay in touch and come back often. Congratulations and best wishes to you all. It was a great decision to have graduation outside and I commend you on making the tough choice. Your speech to the Class of 2016 was encouraging and words well received. It was a nice ending to an otherwise boring, long and disappointing graduation. The commencement speech by William Adams was thirty-five minutes too long and politically correct. He was not motivating or encouraging to the class. His views of the world gave no insight to what the graduates needed to hear. I recommend as a parent and $240,000.00 financier that the commencement committee try a little harder and find someone who is relevant and can clearly express words of wisdom to the graduates. As far as the student of the year, another disappointment. Was the committee again trying to be politically correct or does he really encompass the Lafayette dream? He was a 26-year-old foreign transfer student. His sexual orientation bears no value. I’m sure out of the remaining nominees that there must have been a four year, on campus, Lafayette graduate that accomplished many goals and encompassed the ideals of Lafayette College. Last year’s winner, Cory Spiera, was that person. Once again, for $240,000.00, most parents expected much more.